If you can’t get your laptop to ‘see’ any WiFi networks, or it can’t even see its WiFi adapter, you might have accidentally turned it off. If you’re somewhere that definitely has a WiFi network, and your laptop can’t see it, that’s almost certainly what’s happened. Like your mobile phone, tablet, or Kindle, your laptop will have an “Aeroplane mode” which turns off all radio communication – disabling things like WiFi and Bluetooth. With Windows 8.1 and Windows 10, you can do that from inside Windows. With all laptops, though, you can also do it with a button or a slider switch – and sometimes when you do it that way, Windows can’t undo it. Older laptops tend to have a physical switch or a slider. They’re all in different places, so you’ll need to look around all of the surfaces and edges of your laptop to find yours. Usually they’re above the top row of keys (between the top row of keys and the hinge to the lid), or on one of the sides (near things like the USB ports). There’s no standard – sometimes “on” is to the left, others it’s to the right. Sometimes there’s a light, sometimes not. Sometimes there’s a notch or a grove, others there might be a coloured bit of plastic. When there’s a light, the light being on doesn’t even mean that WiFi is on: sometimes there are two different coloured lights! Trial and error is best. Try searching for WiFi networks on your laptop, change the switch’s position, then try searching for WiFi networks again. Make a note once you’ve found how yours works! Most modern laptops have an Fn key at the bottom left of the keyboard (usually with blue or mauve paint), and then the top row of keys double up as both F1, F2, F3 etc and shortcut keys for things like volume, brightness, and WiFi on/off. There’s no standard here either – each manufacturer has their own way of doing things, and they change from laptop to laptop. There’s no standard icon – sometimes you’re looking for an umbrella icon, others an image of a laptop with waves coming out of it, sometimes concentric circles coming from an ‘antenna’, and others a radio tower icon. Usually you’d need to press the Fn key at the bottom left of your keyboard and the key with the WiFi pictogram for it to be effective. Sometimes, though, the Fn key makes the key produce the F1, F2, F3 etc action. Again, trial and error is best. You should expect some kind of onscreen acknowledgement that you’ve changed something. 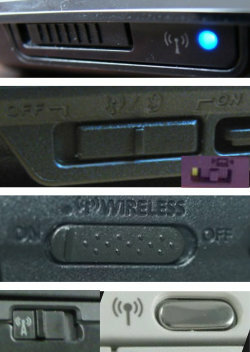 Some HP laptops have a WiFi indicator light on, or near, the F12 key. The light is always on, no matter if WiFi is on or off: the colour is important. Blue (nearly white) means on, while Orange (nearly red) means off. This can be confusing, because other laptops will use orange to mean “on” and then no light to mean “off”.